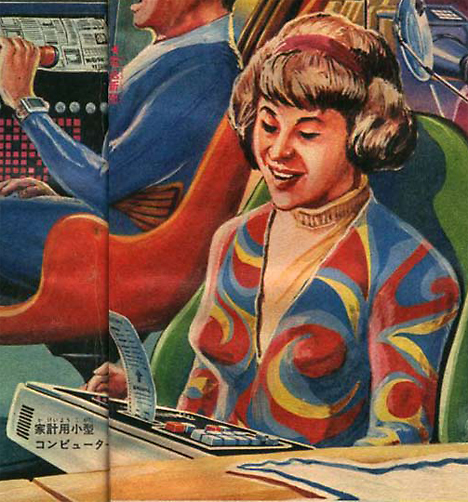 In 1969, Shōnen Sunday magazine featured a series of illustrated articles entitled "Computopia," which depicted life in a pleasant future pervaded by computers. Here are three illustrations from the series (1, 2, 3). 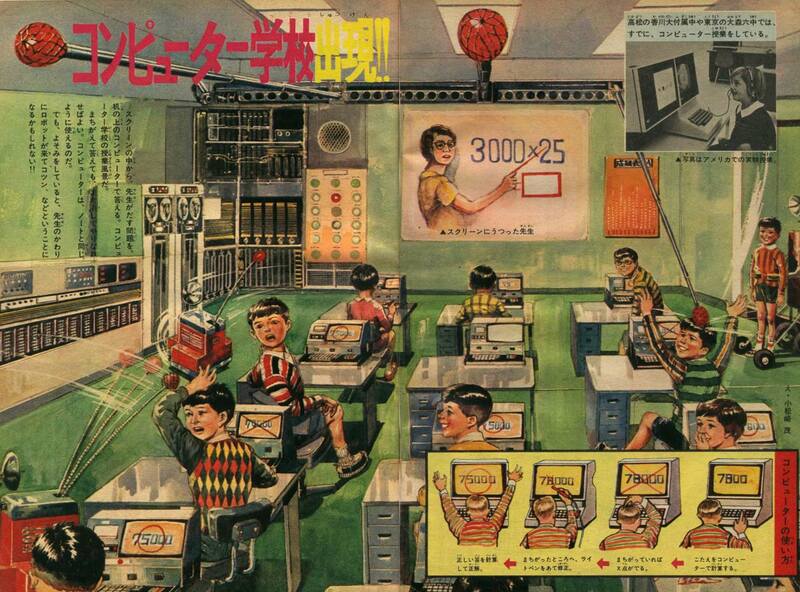 "The Rise of the Computerized School," illustrated by Shigeru Komatsuzaki, takes a peek inside the classroom of the future, where the teacher is an image on a screen and students sit at desks equipped with computers. When the teacher presents a problem, the students input the answer into their computers. If an answer is incorrect, the students use a light pen to make revisions on the monitor until the computer says it is right. 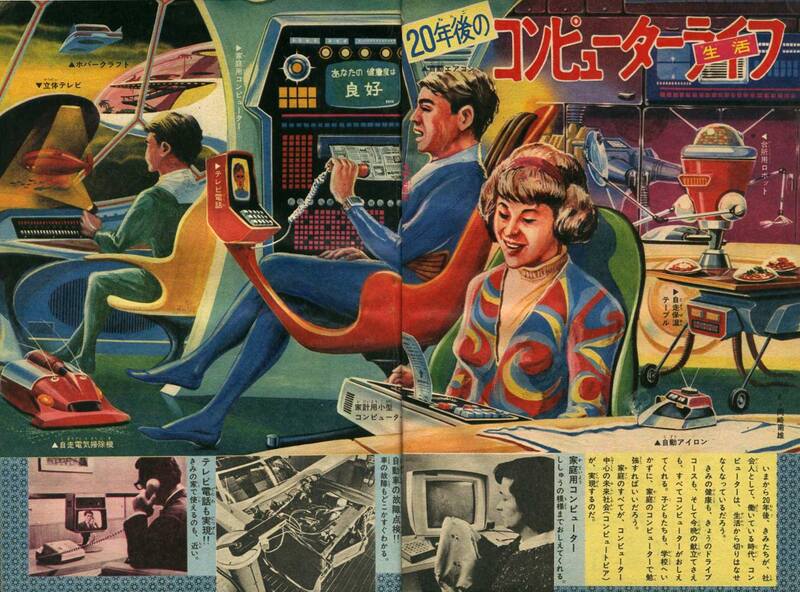 This illustration by Toshio Okazaki, entitled "Computer Life in 20 Years," depicts what the typical household might look like 20 years in the future -- in 1989 -- after computers have become an integral part of daily life. 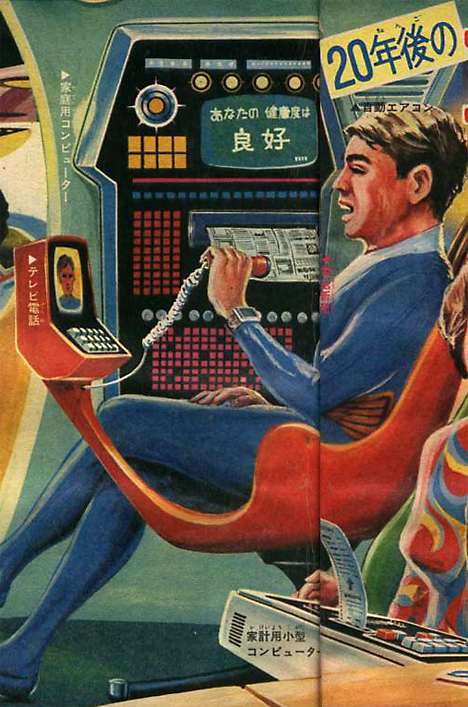 In this high-tech home, dad chats on the videophone while the wall-mounted home computer spits out a newspaper and the automatic air conditioner cools the room. Junior's eyes are glued to the 3D TV while an autonomous vacuum robot cleans the floor nearby. A hovercraft floats in the sky outside the window. Mom performs calculations on a miniature home computer. 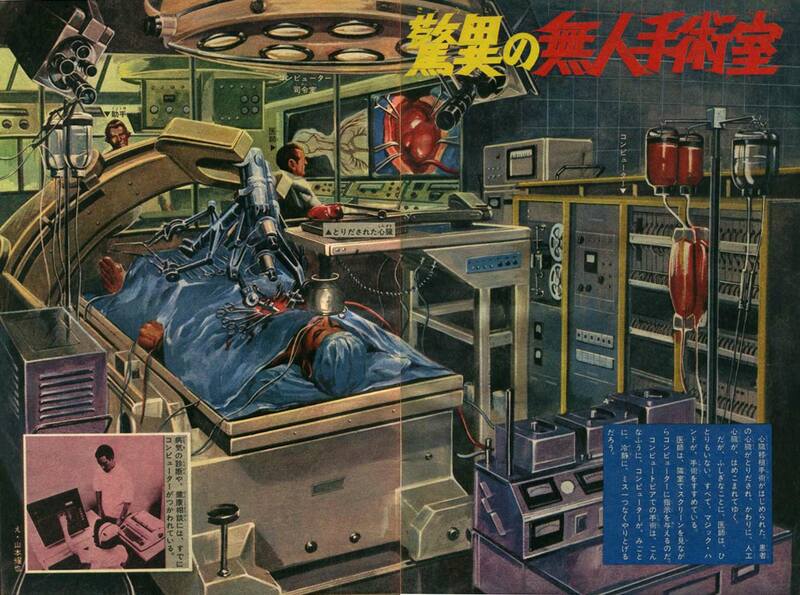 "The Amazing Unmanned Operating Room," illustrated by Teruya Yamamoto, takes a peek inside the computerized hospital of the future. Funny to how, when imagining the future, illustrators (and movies) unconsciously cling to certain aspects of the present. Like a paper printout - or enormous computer terminals. 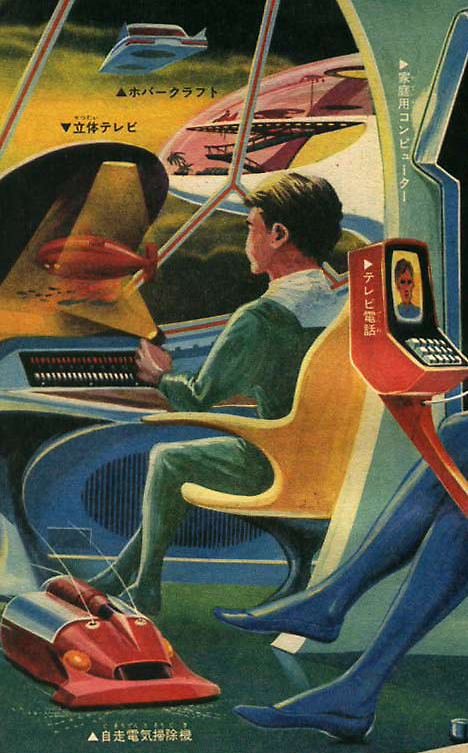 Wonder what will seem antiquated when 2030 look at our ideas of sci-fi? 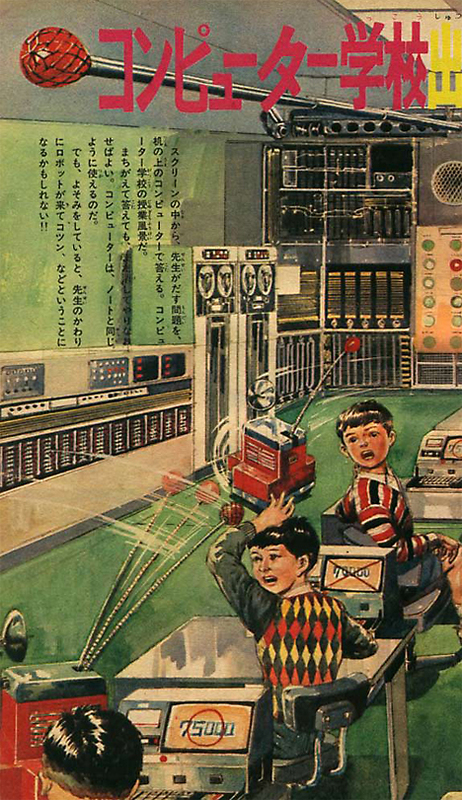 I like how they predicted that we would design a robot to beat the attention-deficient children of the future. He's not being beaten for lack of attention or acting up, but for getting the wrong answer! The Overmind will accept nothing less than perfection. 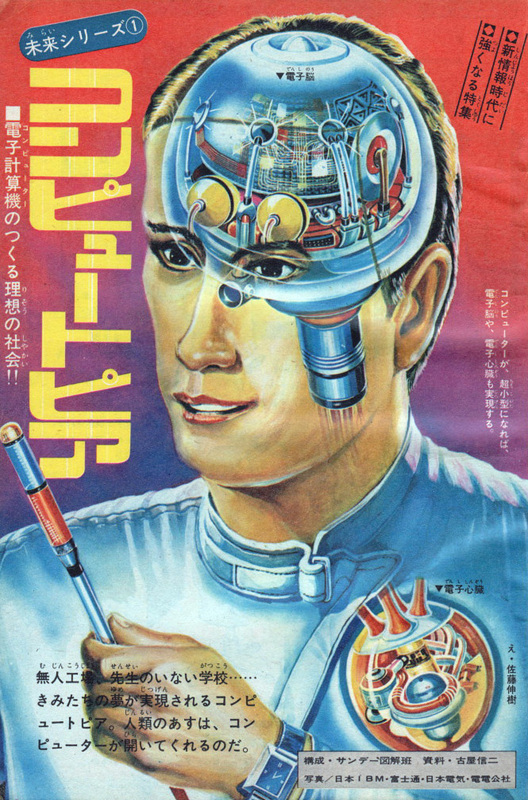 Thanks, I keep hoping old Japanese science and technology magazines will magically appear on Google Books someday, but to no avail. 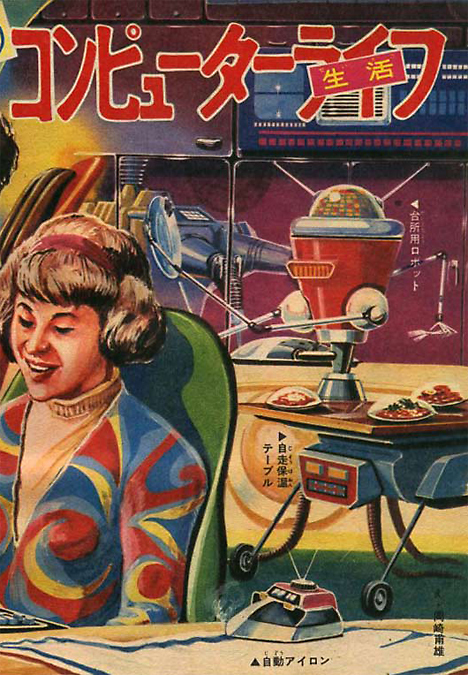 If you look at some of the old Popular Science and Popular Mechanics you will find their predictions just as much fun as the Japanese (or any other) to us from our vantage point in their future. I reckon those are Japanese becoming Caucasian. 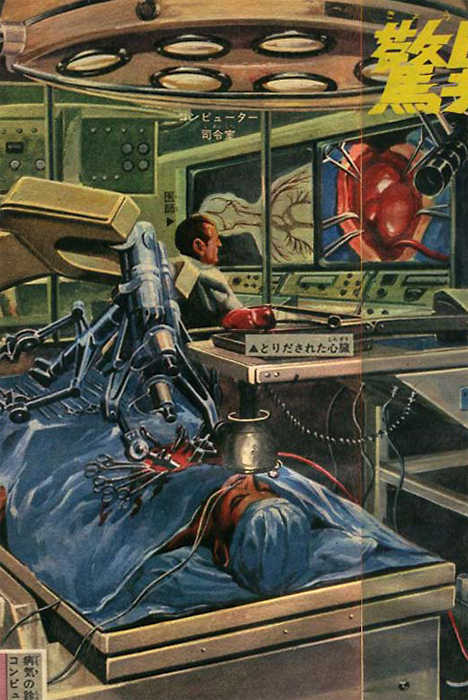 Creepy to think there was ever anyone who would have thought such a world as illustrated, desirable. Or was this some kind of warning. Do you have any other posts relating to this? 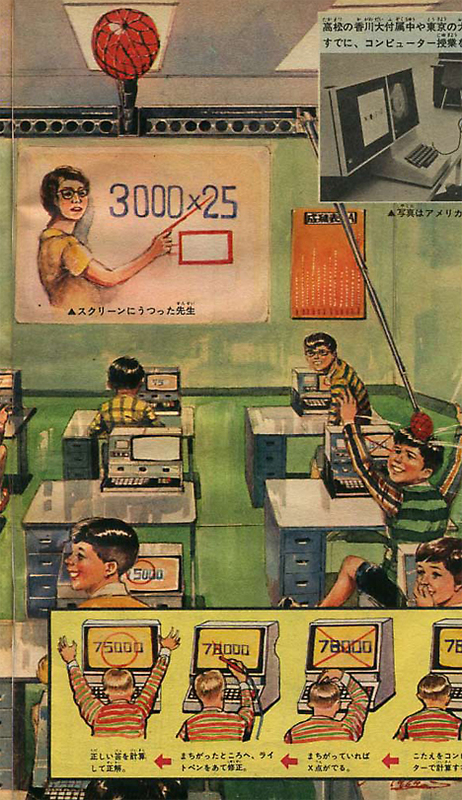 Visió de 1969 de l’aula informatitzada (i d’una casa, i un quiròfan) « AMPA IPSE BLOC … un espai per a la comunicació i per a la participació.